The Boston Bruins were one of the best teams on home ice last season. However, their road form was far from spectacular. The club went 17-17-7 in their 41 matchups away from TD Garden last year with a goal differential of minus-12 (101 goals for, 113 against). The most telling statistic that contributed to Boston missing the playoffs was their performance for the final nine road games of the season. The squad picked up just six of a possible 18 points (2-5-2) during that stretch and tumbled out of the Eastern Conference top-eight. It was a sign of a weary team that just ran out of gas down the stretch. Thankfully, the new schedule brings a clean slate to the table. Boston will have the opportunity to make amends for their woes away from home. It also opens the door for fans to plan road trips to watch their beloved Black and Gold play away from Boston. Earlier this month, I discussed the five can’t miss home games in Boston this coming season. Now, we present the five road games that should be circled on your calendar. Boston will make their maiden voyage to Brooklyn on Friday, October 23 to face-off against old friend Johnny Boychuk at the Barclays Center. The Islanders were one of the NHL’s biggest surprises last year going 47-28-7, finishing in a tie for second in the Metropolitan Division. They were determined to make their final season at the Nassau Veterans Memorial Coliseum a memorable one but fell to the Washington Capitals in the first round of the playoffs. The Isles have now moved east into the home of the NBA’s Brooklyn Nets and will look to maintain their momentum from last year. Boston will have the honor of being the first Eastern Conference opponent for New York in their new abode. Bruins fans are sure to come out en masse for this Friday night tilt. None of the five games against the Canadiens are part of a back-to-back. Biggest schedule win for the Bruins. The Bruins and Canadiens will renew their rivalry at the Bell Centre on Saturday, November 7 on Hockey Night In Canada. The Black and Gold will look to reverse a trend that has seen them lose four of their last five games in Montreal dating back to 2013. The Bell Centre was a house of horrors for the Bruins last season, losing both games while being outscored 11-5 by their hated rivals. Montreal has one of the loudest buildings and crowds in the NHL and, for the new Bruins, will require some getting used to. It will be a true baptism by fire for Matt Beleskey and Jimmy Hayes to get immersed into the long-standing hatred between these two Original Six franchises. 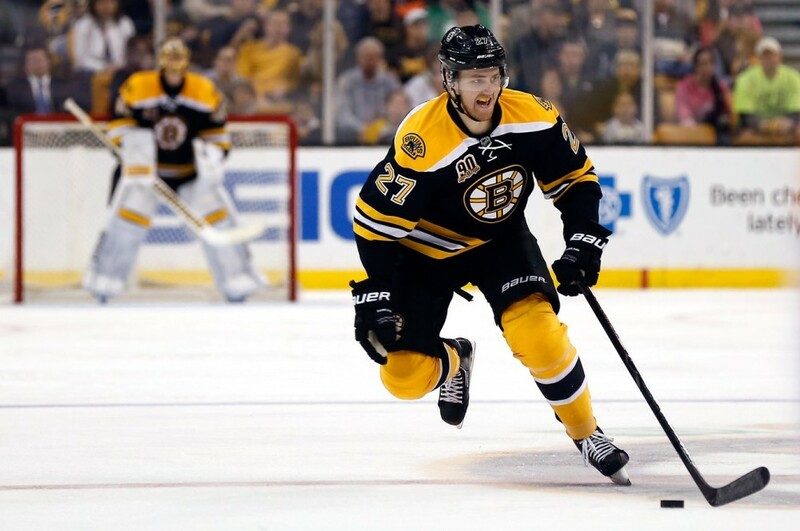 Boston fans were treated to the first three years of defenseman Dougie Hamilton’s promising young career. Now, they will have to watch his progression from behind enemy lines. The Bruins will visit Calgary in early December to take on Hamilton and the upstart Flames as part of their annual Western Canadian road trip. The 21-year old defenseman is coming off a career-year and now joins an excellent defense corps in Calgary including captain Mark Giordano, TJ Brodie and Kris Russell. The Hamilton trade was not received well by fans and for good reason, knowing how poor of a return Don Sweeney got for what many believed to be a franchise player. The Bruins will get their first look at his new digs when they head to the Saddledome, looking to avenge a 4-3 overtime loss in this same matchup last season. 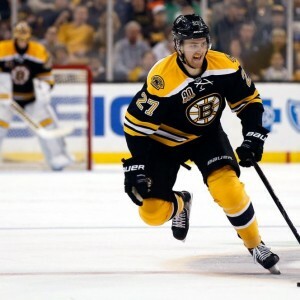 Former Boston College defenseman Noah Hanifin will play his first game against the Bruins in late February when the Black and Gold visit Carolina to battle the Hurricanes. The fifth-overall pick in June will join a rebuilding Canes team under second-year head coach Bill Peters. Hanifin performed well in his freshman season at BC recording five goals and 23 points in 37 games before declaring for the draft. The Norwood, MA native now finds himself as one of Carolina’s building blocks for the future. The Canes played Boston tough in all three matchups last year. The Bruins split their two games in Raleigh, suffering a 2-1 shootout loss back in January before claiming an overtime victory by the same score line in March thanks to this David Pastrnak goal. The last road game for Boston this season may be the most anticipated. The Bruins will have to wait until April to battle the Stanley Cup Champion Chicago Blackhawks at United Center. It is always a memorable encounter between these two Original Six rivals, especially at the “Madhouse on Madison”. This Sunday afternoon battle has become a staple in the NHL schedule since the two clubs battled it out in the 2013 Stanley Cup Finals. It will be the third year running that Bruins/Hawks has been nationally televised on NBC. Boston has enjoyed success in the Windy City going 4-0-2 in their last six road encounters against Chicago. This is a game that every NHL fan will want to circle on their calendar.